“Night and day, wind and storm, tide and earthquake, impeded man no longer. He had harnessed Leviathan”. The Machine Stops pictures a future in which humanity has abandoned the surface of the Earth, grown unable to breath the atmosphere, and moved underground in the so-called Machine: a planetary system of individual cells, each hosting a single human being and providing to his/her every need, such as light, food, sleep, water, literature and music, and most peculiarly the possibility of communicating with every other cell in the planet, via video-conference. Work in the age of the Machine has therefore disappeared, save for a few exceptions, and people spend their life ‘spiritually’, in the pursuance and discussion of ‘ideas’: which however are often only second-hand, since direct experience has come to be considered unfit, and people seldom if ever leave their cells. Human contact is accordingly nearly non-existent, save through the Machine’s speaking apparatus. It is by the speaking apparatus that, as the story opens, Vashti is contacted by her son Kuno—only to be asked to visit his cell, half the world away (from Sumatra to Wessex in England). Vashti strongly opposes the prospect, since travelling is now disliked even though permitted, but eventually agrees, for Kuno’s cryptic remarks (which he refuses to explain “through the wearisome Machine”) have upset her. Once there Vashti learns that Kuno has been on the surface, and without an official Egression-permit to boot, and once caught has consequently been threatened with Homelessness: expulsion from his cell and exposure to the surface air, now deathly to humans. Vashti is horrified by her son’s ‘unmechanical’ behaviour and even more by his beliefs, and resolves never to see him again. What Kuno does “is contrary to the spirit of the age”. He yearns for first-person experience, and his escape is exemplary. As he ascends towards the surface he feels he’s getting beyond the influence of the Machine: “Man is the measure. That was my first lesson”, he says. During his brief visit aboveground he regains a sense of place and of belonging: “I have seen the hills of Wessex as Ælfrid saw them when he overthrew the Danes”. His description of the constellation of Orion as a man with a belt and a sword is perhaps akin to the earliest first-hand ‘ideas’ that ever occurred to mankind. When he is finally caught and returned to his cell, he describes this as being dragged back into hell. Step by step, Kuno is freeing himself from psychological deference to the Machine. “I felt, for the first time, that a protest had been lodged against corruption, and that even as the dead were comforting me, so I was comforting the unborn. I felt that humanity existed, and that it existed without clothes. How can I possibly explain this? It was naked, humanity seemed naked, and all these tubes and buttons and machineries neither came into the world with us, nor will they follow us out, nor do they matter supremely while we are here”. Such behaviour is simply unacceptable, and Vashti feels her son is doomed. “On atavism the Machine can have no mercy”. The Machine is perfect, hence totalitarian. Both eugenetics and euthanasia are regularly practiced, and so is the death penalty. There is one single, chilling reference in the text to a previous Great Rebellion, after which an unspecified number of people were simply left to die on the surface. Besides, the Machine actually isn’t perfect: people are instead constantly forced to adjust to the standardised quality of life, and do so only because they have given up all hopes and thoughts of improvement. The Machine is absolute, definitive, and mankind has begun to evolve around it: they are now short, “white as fungus”, and their muscles are nearly powerless from lack of exercise. In the years following Vashti’s visit to Kuno, a sort of religion develops around the Machine, curiously reminiscent of certain elements of Christianity (persecutions included). People now hold the Machine to be omnipotent and eternal. But over time malfunctions begin to appear and to accumulate, as the knowledge of how to repair them has been lost. The man-made Machine falls into decay, inevitably. And the day will come, when the Machine stops. Originally published in 1909 and reviewed by the author in 1928 (which is why this edition has the copyright for 1928), The Machine Stops anticipated television, videoconferencing, and Matrix by several decades. Not to talk about the internet. The Machine is more totalitarian than Orwell’s IngSoc, and resistance to it is a striking ancestor to the concept of ‘crimethink’. 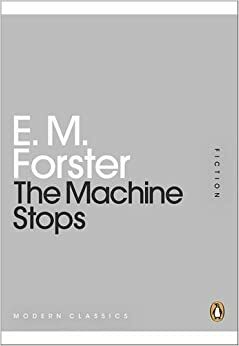 Moreover, Forster’s prose is a wonderful instrument, capable of great precision as well as of sudden poetical openings: “Above her, beneath her, and around her, the Machine hummed eternally; she did not notice the noise, for she had been born with it in her ears. The earth, carrying her, hummed as it sped through silence, turning her now to the invisible sun, now to the invisible stars”. On the public domain and available for free. It lacks the final 3-odd pages of the revised version, which add a whole new dimension to the meaning of the story. The 1966 BBC adaptation for the sci-fi TV series Out of the Unknown is available on youtube (another old link is currently dead). The story was filmed again in 1999 by the Freise Brothers: a remarkable reinterpretation with beautiful computer graphics. A 10-minute short version of the film is available here. Very cute, but only useful if you are looking for one short-story in particular; otherwise you’d better turn to the complete short-story collections. This was written by alessandro montagner. Posted on Saturday, June 29, 2013, at 08:00. Filed under English, LETTERATURA, Narrativa. Tagged distopia, E.M. Forster, Europa, fantascienza, Inghilterra, Penguin, racconti. Bookmark the permalink. Follow comments here with the RSS feed. Post a comment or leave a trackback.